Think outside the box with our simple guide. 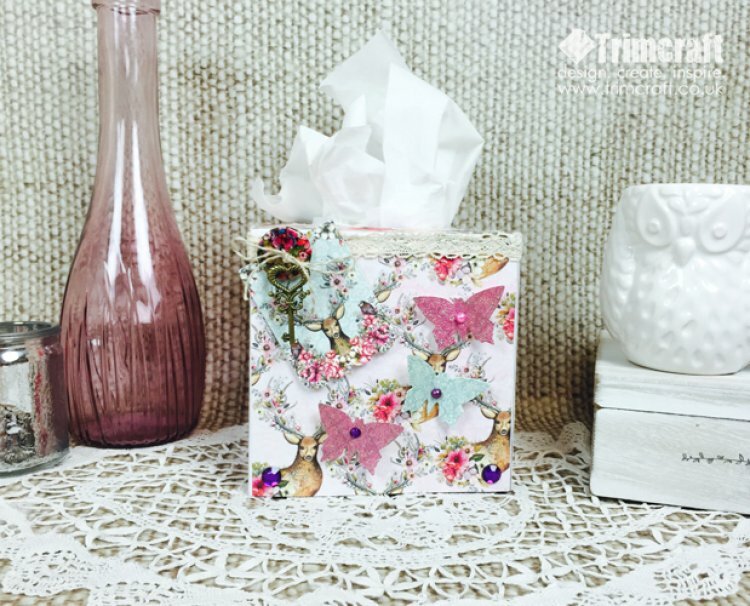 We have used the new Dovecraft Bohemian collection to create this beautiful tissue box. 1. Measure the top of your tissue box and add 5mm onto each side. Add a 1.5cm allowance to the outside edge, then score your white card stock and cut out. The extra 1.5cm will make a fold so you can join to your box with ease; see our sketch to help you. 2. Cover the top of your box with your chosen patterned paper and then turn over. In the centre, draw an oval and cut it out to create an opening for your tissue box. Cut to the score line on each side of the cardstock; join the sides together to make the lid. 3. With a piece of cardstock, measure two sides of your tissue box and add on 5mm to the width of each side. On one side of the card, add a 1.5cm fold so it is easier to join your box sides together. 4. Take another piece of card stock and repeat step 3 to make the other two sides. Score and fold two sides and stick both pieces of card together using double-sided tape. 5. Fit your tissue box lid to the top of the box and stick the sides inside the box. 6. For each side, cut patterned paper to fit each side by 12cm x 13.1cm and stick to the box. We have picked papers to coordinate with our colour scheme. 7. You will need approximately 50.5cms of lace to create a decorative border to the top of your box. In the left hand corner, we have used string to attach a patterned button and metal key charm to the lace. Tuck a gift tag under the button and stick to the paper using 3D foam tape. We have decorated the front of the tissue box with butterfly toppers, adhesive pearls and gems. For a cheerful colour scheme, we also created this tissue box using the Back to Basics Bright Spark paper collection. We used contrasting paper to print the All you need is love and Make a Wish stamp, once dry, cut and stick to the sides of the box. To finish, layer a wooden frame on top of the stamped text and embellish with two paper blossoms and button centres. We have used the colourful Bright Spark buttons to create a pretty border around the tissue box. Perfect for crafters who love pastels, we also made this tissue box cover using the Dovecraft Bright Sparks papers. We decorated the box by folding two doilies around the front of the box and adding three layered paper blossoms using double sided tape. We then finished the paper blossoms with adhesive pearls to the centre of each flower. Have you made anything creative for your home recently? Why not share and upload them to our project gallery.